This was my first investigation with the Ghost Hunters Society. After doing an interview with a Purdue University film crew I began walking around the cemetery hoping I would get some voices on my generic tape recorder. Having had many experiences as a child I believed that my contact with ghosts would assist me in picking up their presence. Maybe even bring them out. As I walked around I felt nothing, until I got closer to a corner of the cemetery. The fence was peeled back to expose a small pond near the highway. As I looked in that general direction I started feeling as if bodies were dumped in the pond. I stopped and focused. As I remained quite, gazing ahead towards the pond, Bob Madia, Unknown Magazines assistant editor and full time police dispatcher noticed my stare and said to me. "You know, rumor has it that Al Capone's Men used to dump bodies in that pond." I leaned over, "Oh my god, you are kidding me!!" I feel to my knees in shock. I told him what I was just feeling. We walked over there and noticed a consistent drop in temperature. I felt strongly that this is where the ghosts people have been photographing were coming from. I called over some of the investigators and told them to use their equipment and see what they could pick up. One of detectors picked up a decrease in temperature, this was about the same time that I recorded a voice. We also felt cold spots moving around us. I sat there staring out to the pond, and as best as I could pick up. 4 bodies were dumped there that stood out the most. Each on one of the 4 corners of the pond. A man, short, scrawny, red haired, slightly bald, with a white tank top on. A women. associated with the mob, most likely one of Capone's assistants or secretaries. Two men. One not associated directly with capone. Just a guy who knew to much or caused to many problems. The other one of Capone's hit men. He had gotten involved with something outside the group and and to be eliminated. He didn't know when he went with the three other men to dump one more body that he would end up being the 2nd body that night. He ended up being the last one to fill the pond. These bodies, if I am correct on what i picked up that night, should still be at the bottom of the pond. Their ghosts have been haunting Bachelors Grove. They are the specters that have been recorded and seen over the years. They were murdered. Never had a proper burial and were dumped right next to a cemetery. No one knows they are there and that they are saddened that they are right next to a place were people are laid to rest. They feel they never received the same treatment. A proper burial. The only part of the investigation I focus on is to try and make contact with the ghosts, pick up any possible information, and hopefully record their voices. The other members of the group take photos and use some amazing equipment beyond my expertise. i hope to have them submit a summary of what they came up with as well. 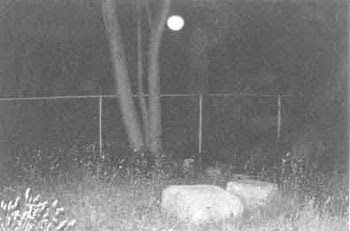 In the future, I hope to go back to Bachelors Grove in the future with a Ouija board and see if I can get any names or dates to identify these ghosts. Note: John has a photo of some fog that was no present at the time near the pond when I first walked over. Tim Harte of G.E.I.S.T. had taken a few rolls of film. 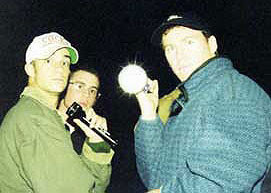 The only picture that came out was the one you see here of me and some other investigators. We were startled in the dark as the flash from his camera went off.I am the one with the flashlight, which didn't last very long. It seems that batteries tend to be drained of power very quickly at Bachelors Grove.